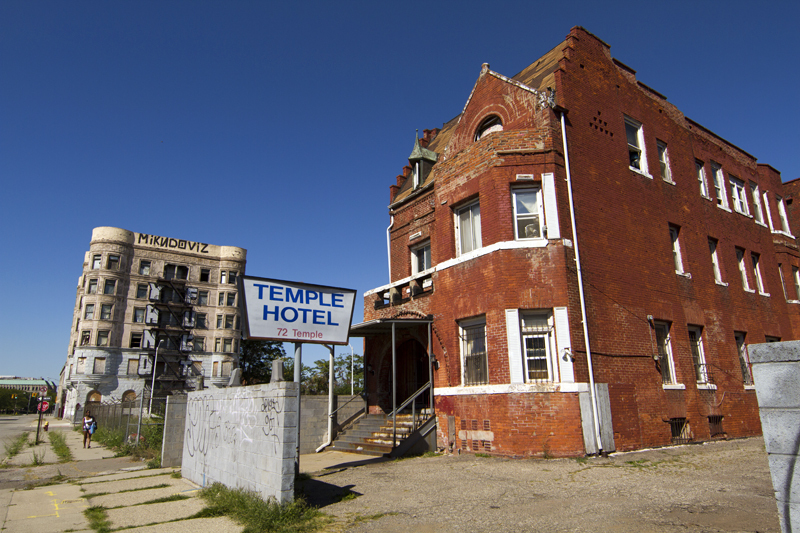 The graffiti-tagged Temple Hotel earned a reputation as a hardscrabble hub for drugs and prostitution in the seedy Cass Corridor. Intermittent homeless people stayed at the three-story redbrick building on an otherwise abandoned, graffiti-tagged block on Temple. Rates were by the hour, day or week. To the outsider, it was just another blighted building in a forlorn section of Detroit’s notorious Cass Corridor. But as most of us now know, the hotel is in the shadow of Mike Ilitch’s entertainment empire that will include a new Detroit Red Wings arena. The hotel was appraised at $81,400, but DTE recently purchased the building for more than $3 million, according to people familiar with the deal. DTE plans to demolish the building to make way for infrastructure improvements that will be needed for the new entertainment district and Midtown. The purchase price is an early sign of the times to come. Cass Corridor, which is considered the missing link between Midtown and downtown, is home to many low income residents who have come to depend on the safety net around them – hospitals, soup kitchens, mental health services, low-income housing. Investors and developers, however, are hoping to cash in on the entertainment district by buying up property, including low-income apartment buildings. A mysterious investor evicted hundreds of residents from three federally subsidized apartment buildings earlier this year, but backed out after many tenants already left. The entertainment district leaves the Cass Corridor especially vulnerable to gentrification. Restaurants and boutiques are expected to open, and apartment buildings could be converted into condos. George Jackson, president and CEO of the Detroit Economic Growth Corporation, said earlier this year that he welcomes gentrification. We will be following this issue carefully. For tips, email us at sneavling@gmail.com. Interesting. I do believe gentrification is the wrong word to use in these situations. I remember gentrification as people who came to an area, bought a property, improved it and others followed. At no point did those people get tax abatements and writeoffs. They saw a good deal in a property that had good bones and they invested their time and money in improving it. That is not the case with this present generation of “gentrifiers”! They buy property at rock bottom prices, get tax abatements and then run off long time residents. 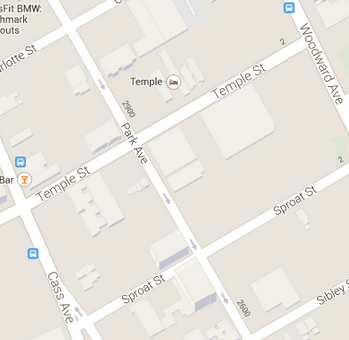 George Jackson doesn’t live in those areas. The low income and disabled people who lived there because they could afford nowhere else to live have been a blessing to those slumlords who are now kicking them out for the big buck. Living under capitalism is hell!!! Capitalism, the term used by commies, the term needed here is Commerce, which is what is happening here. “Long term residents” are what is known as acceptable losses. Progress has it’s acceptable losses. In Poland we say Tough shitski. Commerce seekers will be the turn around people, not the hangers on and victims of self induced misery. Onward and Upward to the money muscle resucitators of the Corpse. Good to see Whites powerplaying these areas, like in Homestead or Pittsburgh, areas abandoned and squatted, sectioned 8’ed to rubble. Power money will push out the dregs and create a Bohemian Hiptser area, ohhh the locals will scream and cry gentryfication, good, screeeeeeeeeaaaaaaam, time wins in the end, it beats out the socialist keg drainers and loudmouths. Just had to wait the 67’ers out, finally the “Dream” is revealed as turmoil and lies, proofed by brown baggin bottle carryin’ junkie “long time residents” soon to be shown the door. Exit stage “underpass condo”. Bring on the White Bohemians, gentrify it up, some claim to Have a Dream, sleepers dream, the awake Have a Plan, better run!!! Gentlemen, gentlemen…why so angry? If this is truly your time, so be it. However, the other thing i know about capitalism is that it works hard to make people think they can gain nothing by working together. As we watch middle class whites priced out of midtown and downtown Detroit, the question becomes, who is this all for? if not low income people of color; if not the elderly; if not the disabled; if not the middle class whites who moved in and must now move out because the rental rates are too high; who is it for? Now i certainly understand your positions if you are both friends, acquaintances, golf and yacht buddies of gilbert and illitch. if not, i think you’re going to realize, and not that very long from now, that you have been duped, bamboozled, hoodwinked HAD!!!! capitalism pays for those old poor people to live free. The alternative is nothing. The government cannot make anything, they can only tax. You are basically a parasite and your people are living off other peoples hard work, no responsibility, you hate it, etc wow what a burden. The low income people will move to a new place for free. Whoever builds on that site will pay taxes, employ people who pay taxes in Detroit, attract weekend spenders and begin the process of rebuilding. It is the only way Detroit has a chance of avoiding becoming Armageddon. The only other option is to spend state money on extra police in surrounding suburbs and effectively bottle up the trouble in Detroit while it continues to sink into greater degradation and crime. There are many racist Detroiters who would rather live in a black city in any condition than allow whites in to make it inhabitable. They fight every attempt at upgrading places like Cobo Hall and Belle Isle, and seemingly can’t wait to get their next criminal Mayor in office. They elect people like Joann Watson and Brenda Jones. It is tempting to say, ” let them have their way,” and let the city find it’s bottom. But there are too many good people who are caught up in this mess through no fault of their own to advocate for such a fate. Still, you wonder how people like Brenda Jones can come second in at-large council voting in the primary. Do they not understand what she represents or don’t they care? Try using once great Cass Park as a non-homeless, non-begger, non-crack user and tell me the area doesn’t need a little investment and gentrification.